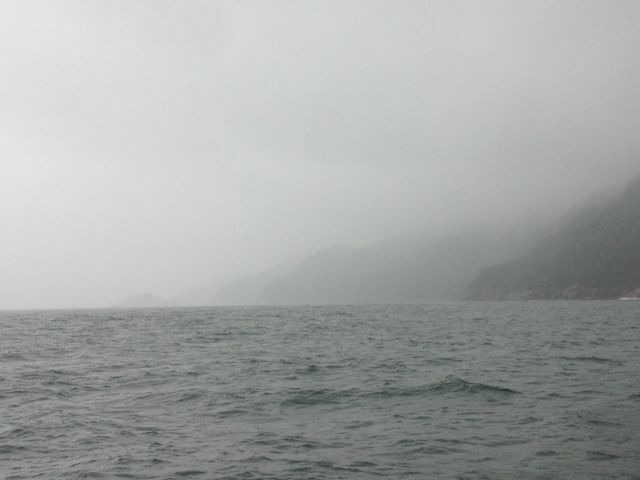 The Captain woke me up at 6am to a grey, rainy, windless day. I was surprised to realize that the rain was warm, so this is not a squall -- storm-flung rain that wants to be hail -- it is just a normal rainy day. Our first rainy day. Eric told me that our ETA in Santos is 6pm, 12 hours to go. I know I have had a nice relaxing vacation (well, maybe I shouldn't categorize this vacation as relaxing), when my brain starts to think about new ventures, when I start missing my students, when I can’t wait to get back to my practice and playing. Also, when I start thinking of packing my stuff back into the duffle bag. The state of John’s and my clothes is pretty sad. Everything we own is either really wet, somewhat wet, damp, smelly and/or dirty (I was hoping to dry some of our things on the lifelines today -- but with the rain not possible). And we are arriving tonight into the Sao Paulo millionaires yacht club. Without any clean/nice clothes to wear, either we have a problem, or we might just pretend we are eccentric millionaires who have just arrived after a world cruise. Yes... eccentric will have to do. We spent the day anticipating our arrival. I started to pack, which turned out to be a big mistake. 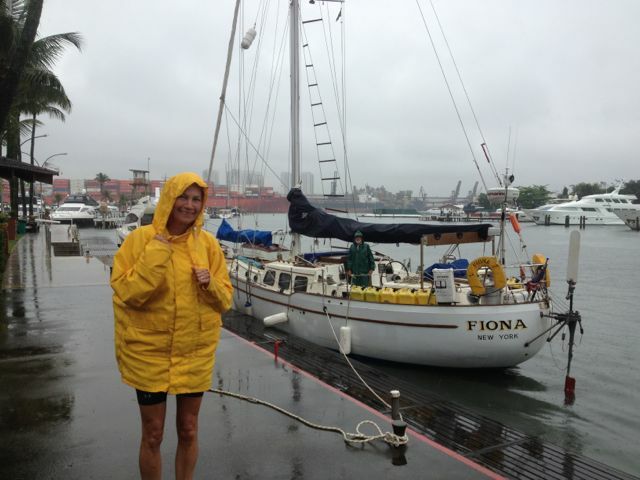 I slept for a while in the morning, we had lunch, and after a foggy, rainy, really nasty afternoon, we finally arrived in Santos yacht club. Amazingly enough, alcohol consumption aboard Fiona had been tightly regulated. One beer for lunch, one single serving of rum during happy hour (except when John makes the cocktails! ), and one beer or a glass of wine for dinner. All beverages are served by the Captain, and immediately corked or put away. For lunch, Eric mentioned to me that I had half a bottle of wine left, and he just put the bottle on the table and suggested I finish it. I was surprised. Wow, I get to drink as much as I want today? really? Another sign that Eric knew exactly what he was doing. By the time I finished the last two glasses of wine left in the bottle, I was done for the day (maybe it was lack of practice -- I have to work on that.) I went back to my bunk and took a nice long nap. If he needed me on deck, he would have to wait. On our approach to the yacht club, once again, I was in charge of the radio communications, but I wasn’t able to connect -- we didn’t have the club channel 65. The radio dial goes from 1 to 64 and then from 67 on. Go figure. The restaurant was closing at 8, so we decided to leave the boat on the fuel dock until tomorrow. We'd have dinner while the restaurant was still open, and then take the so-much-awaited shower (yes, the really much-awaited shower again). Dinner was very lively with the company of Jack Daniels, Bacardi Gold and Chilean red wine. Back on Fiona, because I have already started to pack, I struggled to find the basic necessities. Darn, it took me two weeks to get organized on the boat. I could find everything I needed in the dark. Now I had to rummage through my put-away sacks and ended up unpacking all again, but now I still didn’t know where anything was. The waters were so calm it felt we were sleeping on land. Tomorrow we will depart -- via bus -- for Sao Paulo. It was an amazing adventure and both John and I are very grateful that Eric Forsyth, the Captain, agreed to take us on board for the ride. 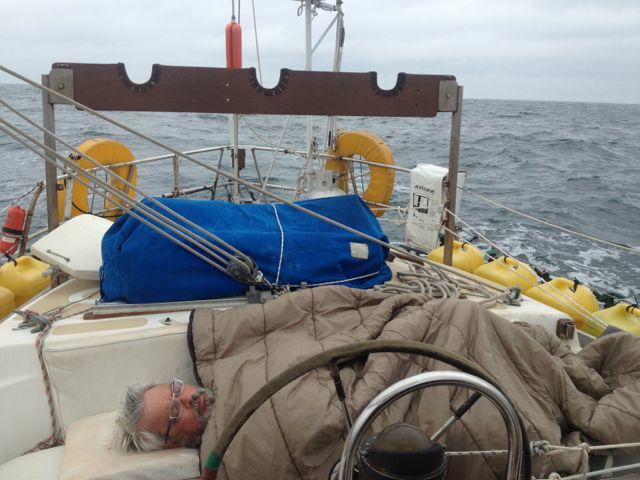 You can follow Eric's progress towards Antarctica on his website, http://yachtfiona.com. Thank you very much for sailing along with us! Spouse and I read your blog together and enjoyed it. We love your sense of humor!